In Part I, we discussed the recent rise in U.S. wildfire, the evidence suggesting climate is a major driver of that increase, and the reality that future increases in temperature and drought frequency (in some regions) will lead to greater fire potential, especially in moisture-limited ecosystems. There is no question that wildfire risk has changed (and will continue to change) as a result of on-going climate change. Importantly, the anticipated shifts in fire will have big implications for commercial forests and conservation lands alike, as well as implications for the climate system itself because wildfire acts as a positive feedback that accelerates terrestrial carbon emissions. Severe disturbance caused by novel fire regimes may also hasten the species shifts expected with climate change, making fire an important driver of ecosystem change in both the near- and long-term. In Part II, we describe the latest research on future changes in fire frequency, extent, and/or severity, as well as discussing management strategies and outlining some useful information sources. Fire potential and the length of the fire season are projected to increase in many regions. These changes will be driven by earlier snowmelt, warmer temperatures (particularly summer), drought stress, and changes in soil water content (Keane et al. 2015; Waring and Coops 2016; Young et al. 2016) associated with climate change. In the continental U.S., the potential for very large fires (>12,355 acres) is strongly linked to meteorological and climatological conditions. Recent research indicates that the potential for very large fires will increase in historically fire-prone regions as a result of climate change, while other regions will experience an earlier start or an overall extension of the fire season as atmospheric conditions become conducive earlier in the year and persist later (Barbero et al. 2015) – see details in The North American Outlook (below). Drier fuels will also increase fire potential because fuel moisture is highly sensitive to temperature. For example, a recent analysis in Canada found that for each additional degree of warming, a 5 to 15% increase in precipitation is required to maintain fuel moisture, depending on the type of fuel in question (i.e. fine surface fuels, duff layers, or deep organic soils) (Flannigan et al. 2016). In the absence of a sufficient precipitation increase, these fuels begin to dry out and move closer to critical thresholds for fire ignition and spread. In fact, Canada is expected to have more days of extreme fire weather because future precipitation will be insufficient to compensate for the drying associated with warmer temperatures – this is true even for future scenarios with the greatest precipitation increase (i.e. 40%) (Flannigan et al. 2016). Some of these changes will be non-linear, leading to dramatic increases in fire frequency or severity in some regions once critical thresholds are crossed. A great example can be found in the boreal forest and tundra ecosystems of Alaska where there are distinct temperature and moisture thresholds for fire occurrence that will likely be crossed by the end of this century, significantly increasing the probability of wildfire and potentially leading to novel fire regimes in those areas (Young et al. 2016). Climate-induced changes in vegetation (including type, density, large scale die-off, etc.) and forest pests will also influence fire risk by affecting fuel loads. As we discussed in a previous bulletin, climate change will affect the population dynamics and spread of many forest pests and diseases, including mountain pine beetle. Mountain pine beetle outbreaks can, in turn, alter the quantity and characteristics of both live and dead fuels by changing the amount of fuel in the forest canopy, the base height of the canopy, the amount of surface fuel, and other aspects of forest biomass. In this way, they can influence fire probability, severity, and rate of spread, as well as the potential for crown fire (Hicke et al. 2012). Climate change will also have direct effects on vegetation and forest biomass through long-term shifts in species distribution and forest composition, as well as small- and large-scale mortality events brought on by drought and other extremes. In Part I, we detailed how drought and beetle-induced mortality in western U.S. conifers is already contributing to an increase in fire. These mortality events and longer-term vegetation changes can flip an ecosystem from being fuel- to moisture-limited (or vice-versa), changing what controls fire activity in a given region (as discussed in Part I). In some cases, the changing fire regime itself will cause vegetation communities to shift or flip from a moisture- to fuel-limited ecosystem. For example, the fire return interval in the greater Yellowstone ecosystem is predicted to decrease (i.e. more frequent fire) to the point that some forested areas will no longer be able to regenerate by mid-century and will instead convert to a new dominant vegetation type that shifts the region into a fuel-limited fire regime (Westerling et al. 2011). Globally, fire probability is expected to increase in the mid- to high-latitudes and decrease in the tropics, with these changes becoming more pronounced later in the century. In the near term (i.e. 2010-2039), the most consistent increases will occur in places with an already somewhat warm climate, but there are also major uncertainties in the next few decades. There is more confidence in projections for the end of the century (i.e. 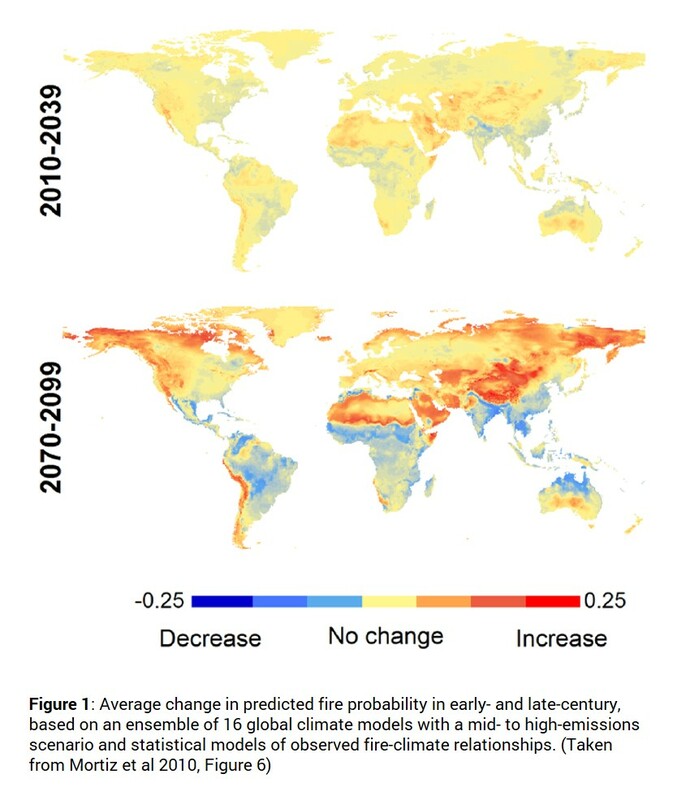 2070-2099) when climate models have a higher level of agreement in their projections because the magnitude of climate change will be even greater, with some locations experiencing an average change in fire probability up to +0.25 (Figure 1; Moritz et al. 2012). Flannigan et al. (2009) also suggest that a general increase in area burned and fire occurrence is likely, based on their review of close to 50 studies conducted between 1991 and 2009 on future fire activity around the world. Although these studies focused on different fire activity metrics, time frames, and locations, more than three-quarters of the analyses pointed to an increase in fire activity. In particular, they noted that fire seasons are lengthening in temperate and boreal regions and this trend should continue in a warming world. Most of the research conducted to date in North America points toward a future increase in wildfire, with longer fire seasons and greater fire potential due to more conducive atmospheric conditions in a number of regions (Barbero et al. 2015; Wang et al. 2015; Liu et al. 2013; Young et al. 2016). For example, in a study mentioned above, researchers from the University of Idaho, the US Forest Service, and the Canadian Forest Service modelled future potential for “very large fires” in different ecoregions due to climate change and they found the potential for very large fires will increase in the continental U.S. The largest absolute increases were predicted for the intermountain West and Northern California, while the largest relative changes were predicted in the northern tier of the country where the potential for very large fires has historically been quite low (e.g., see Barbero et al. 2015, Figure 1). In addition, their analysis suggests the southern U.S. will have an earlier fire season in the future, while the northern regions will experience an overall lengthening of the fire season, with an extension of potential burn days at both ends of the season. These changes are driven by anticipated increases in fire danger and temperature, as well as decreases in precipitation and relative humidity during the fire season (Barbero et al. 2015). Another study by Liu et al. (2013) used results from a downscaled climate model to evaluate how fire potential will change by mid-century (2041–2070), as measured by the Keetch–Byram Drought Index (a commonly used index designed specifically for fire potential assessment). They predict an increase in fire potential in the Southwest, Rocky Mountains, northern Great Plains, Southeast, and Pacific coast due to warming trends, in addition to longer fire seasons in many regions. Looking farther north, the research also suggests increases in fire potential across high-latitude regions. Specifically, the annual number of fire spread days in Canada is expected to increase anywhere from 35–400% by 2050, with large absolute increases in the Boreal Plains of Alberta and Saskatchewan and the greatest relative change in coastal and temperate forests (Wang et al. 2015). Similarly dramatic increases in fire activity are predicted for areas of Alaska with historically low flammability in the tundra and tundra-forest boundary areas, with “up to a fourfold increase in the 30-yr probability of fire occurrence by 2100” (Young et al. 2016). Fire potential is not the only metric we might be concerned about, however. There are also questions about how fire severity may change as a result of climate change. Although fire severity will increase in some cases, as we have seen in the western U.S. with high fuel loads and exceptional drought conditions, future conditions may also decrease fire severity. When some researchers incorporated climate-induced changes in vegetation type, fuel load, and fire frequency, rather than climatic changes alone, they found that a widespread reduction in fire severity was likely for large portions of the western U.S. (Figure 2; Parks et al. 2016). This is because future increases in fire frequency and water deficits will reduce vegetation productivity, the amount of regeneration, and the amount of biomass accumulation on the landscape—all of which contribute to decreased fuel loads that will no longer support high-severity fires (Parks et al. 2016). When considering how to address these wildfire regime shifts, one approach is to “manage for the extremes,” rather than the average fire event or return interval in a given region, because it is the extremes that determine the necessary capacity of fire management organizations and, although these extremes cannot be as easily predicted, they can have serious consequences (Wang et al. 2015; Irland 2013). In terms of forest management, fuels reduction via pre-commercial or commercial thinning operations and prescribed fire is an obvious strategy for dealing with increased fire potential. That said, fuels reduction is better suited for some forest types than others, namely fuel-limited forest communities (Steel et al. 2015), e.g. yellow pine and mixed conifer forests in California or piñyon-juniper woodland and lower montane forests (dominated by ponderosa pine) in the Rocky Mountain region. In systems where the fire regime is primarily moisture- or climate-limited, a reduction in fuels will not be as effective at reducing fire hazard because fuel is not the limiting factor. An argument can also be made for taking a more passive approach that “lets nature take its course,” where the fire regime is allowed to change and it ultimately shifts the dominant vegetation type to something new (as discussed above). In this case, the natural disturbance regime eventually transitions plant communities into a state of equilibrium with the new climate (Parks et al. 2016). This approach may ultimately be more appropriate and cost-effective in locations where conditions are expected to become more arid and fire frequency is projected to increase dramatically, compared with resisting change through on-going, active fire suppression efforts. Although not appropriate for most commercial operations, the passive approach may be a consideration for lands with a management focus on maintaining resilient transitional habitat for wildlife in a changing climate. Of course, it is worth noting that these anticipated changes in wildfire are happening in the larger context of land use change (more development in the wildland urban interface, greater forest fragmentation), fuel accumulation (due to historic fire suppression efforts, landowner reluctance to harvest, and/or insufficient budgets for fuel treatments), and infrastructure/industry changes (lack of “fire wise” development in some regions, loss of institutional firefighting operations with ownership change). Put all foresters and other field personnel through the state forestry department’s basic fire training school. Have the state forest service phone numbers and radio contact on everyone’s cell phone. Equip everyone’s truck with Indian tanks and fire rakes. Know who has bulldozers, where they are, and how to reach their owners. Identify water sources for pumping. Identify water sources for water bombers. Identify landing zones for helicopters. Think about how to communicate with abutting home owners about fire risk. This interface of houses and trees is an increasingly dangerous situation for both the forest owner and home owner. Utilize the resources below to find up-to-date information on potential fire risk. A program that produces landscape-scale geospatial products for planning, management, and operations, including maps and databases that describe vegetation, fuel, and fire regimes. Website provides data, reports, tools, maps, etc. NICC coordinates interagency wildland firefighting resources. They also dispatch Incident Management Teams and resources as necessary when fires exceed the capacity of local or regional firefighting agencies. Website provides Incident Information with daily updates on large fires and Predictive Services, such as weather, fire fuels danger, outlooks, etc., as well as other resources for wildland fire and incident management decision-making. A searchable online portal for fire-related information, including documents, tools, data, online trainings, discussion forums, announcements, and research, as well as links to numerous other fire-related websites and portals for regionally-specific sites and resources. Source for fire science information, resources and funding announcements for scientists, fire practitioners and decision makers. They also produce weekly newsletters. Web-portal for incident information, logistics, predictive services (e.g. information about weather, fuels and fire danger), and administrative resources for wildland fire agencies. Portal to numerous websites and resources related to wildfire risk and detection, including many listed in this table and others. Educational resources on wildfire prevention and “firewise” practices for homeowners and professionals, including state-specific information for New England and adjacent Canadian provinces. Several states/regions have these websites, which include web-mapping applications showing fire risk and assessment, as well as information on historic fire occurrence and information for developing community wildfire protection plans. Provides near real-time, satellite-based detection and characterization of wildland fire conditions in a geospatial context for the continental United States, Alaska, Hawaii and Canada. This data product contains a spatial database of wildfires that occurred in the United States from 1992 to 2013, generated for the national Fire Program Analysis (FPA) system. The wildfire records were acquired from the reporting systems of federal, state, and local fire organizations. This on-line map viewer of satellite-derived global vegetation health products, includes one for fire risk that is updated continuously. You can also go back and see archived maps from previous dates. Source for national fire codes and standards, public education, and research on fire risk and prevention. Young et al (2016) identified two thresholds for fire occurrence, based on historic data: average July temperatures above 13.4⁰C and annual moisture availability (i.e. precipitation minus evapotranspiration) below 150mm. Abatzoglou, J.T. and Williams, A.P. 2016. Impact of anthropogenic climate change on wildfire across western US forests. PNAS. 113(42): 11770–11775. Barbero, R., Abatzoglou, J.T., Larkin, N.K., Kolden, C.A., Stocks, B. 2015. Climate change presents increased potential for very large fires in contiguous United States. International Journal of Wildland Fire. 24(7) 892-899. Flannigan, M.D., Krawchuk, M.A., de Groot, W.J., Wotton, B.M., Gowman, L.M. 2009. 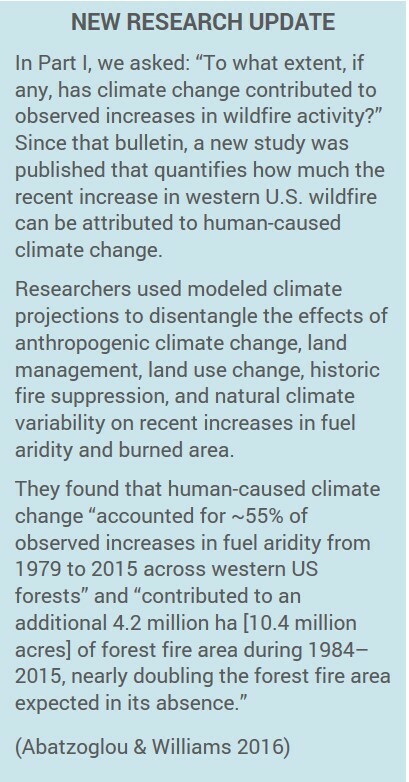 Implications of changing climate for global wildland fire. International Journal of Wildland Fire. 18: 483-507. Flannigan, M.D., Wotton, B.M., Marshall, G.A., de Groot, W.J., Johnston, J., Jurko, N., Cantin, A.S. 2016. Fuel moisture sensitivity to temperature and precipitation: climate change implications. Climatic Change. 134:59-71. Hicke, J.A., Johnson, M.C., Hayes, J.L., Preisler, H.K. 2012. Effects of bark beetle-caused tree mortality on wildfire. Forest Ecology and Management. 271: 81-90. Irland, L.C. 2013. Extreme value analysis of forest fires from New York to Nova Scotia, 1950-2010. Forest Ecology and Management. 294: 150-157. Keane, R.E., Loehman, R., Clark, J., Smithwick, E.A.H., Miller, C. 2015. Chapter 8: Exploring Interactions Among Multiple Disturbance Agents in Forest Landscapes: Simulating Effects of Fire, Beetles, and Disease Under Climate Change in Simulation Modeling of Forest Landscape Disturbances. A.H. Perera et al. (eds.) Springer International Publishing. Switzerland. Liu, Y., Goodrick, S.L., Stanturf, J.A. 2013. Future U.S. wildfire potential trends projected using a dynamically downscaled climate change scenario. Forest Ecology and Management. 294: 120-135. Moritz, M.A., Parisien, M-A., Batllori, E., Krawchuk, M.A., Van Dorn, J., Ganz, D.J., Hayhoe, K. 2012. Climate change and disruptions to global fire activity. Ecosphere. 3(6):49. Parks, S.A., Miller, C., Abatzoglou, J.T., Holsinger, L.M., Parisien, M., Dobrowski, S.Z. 2016. 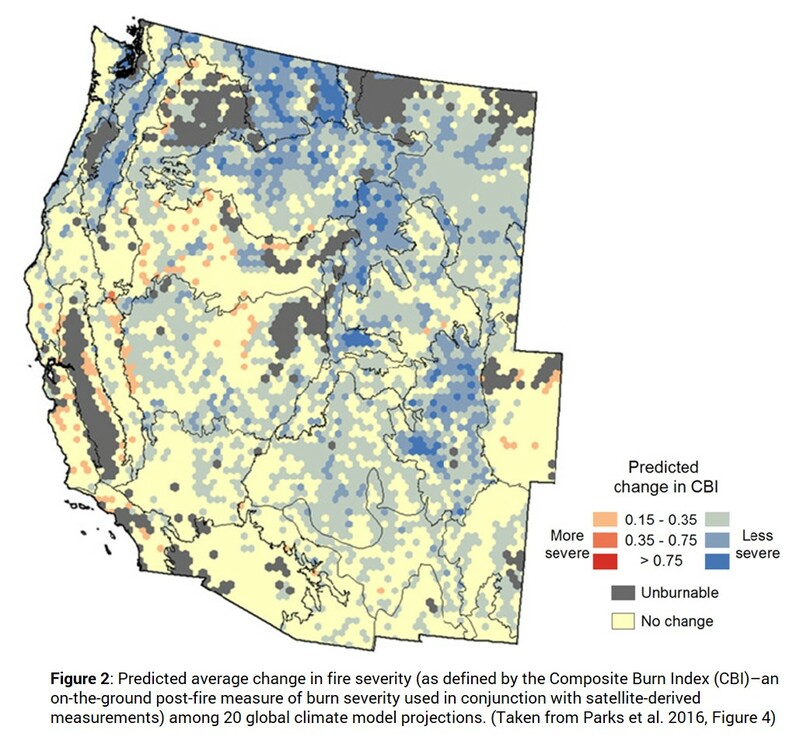 How will climate change affect wildland fire severity in the western US? Environmental Research Letters. 11: 035002. Steel, Z.L., Safford, H.D., Viers, J.H. 2015. The fire frequency-severity relationship and the legacy of fire suppression in California forests. Ecosphere. 6(1): Article 8, 23pp. Wang, X., Thompson, D.K., Marshall, G.A., Tynstra, C., Carr, R., Flannigan, M.D. 2015. Increasing frequency of extreme fire weather in Canada with climate change. Climatic Change. 130: 573-586. Waring, R.H. and Coops, N.C. 2016. Predicting large wildfires across western North America by modeling seasonal variation in soil water balance. Climatic Change. 135: 325-339. Westerling, A.L., Tumer, M.G., Smithwick, E.A.H., Romme, W.H., Ryan, M.G. 2011. Continued warming could transform Greater Yellowstone fire regimes by mid-21st century. PNAS. 108(32): 13165-13170. Young, A.M., Higuera, P.E., Duffy, P.A., Hu, F.S. 2016. Climatic thresholds shape northern high-latitude fire regimes and imply vulnerability to future climate change. Ecography. 39: 001-012.